Is there a media saturation threshold? The animated film “WALL-E” anticipates a future where people are continuously fixed on a screen and some are gradually awakening to the need for real relational contact. Prophetic? Maybe not. Insightful? Definitely. One of the more memorable scenes in the movie is when two men were conversing via video conferencing while floating along in their transport chairs right next to each other. The robot, WALL-E, accidentally knocks one of the men out of his chair and is stuck floundering on the ground helpless. Wall-E not only offers him a helping hand but also shakes his hand as he kindly introduces himself. The “personal” contact startles him yet he is intrigued as something begins to awaken inside. It’s a shame when a robot is more personal than the persons. Are we that far from a similar social dynamic today? According to a recent report by the Kaiser Family Foundation, the average teen spends 7.5 hours a day consuming media. It’s nearly 11 hours a day if you count media multi-tasking. It was recently reported that YouTube has now reached 2 billion video views a day and 24 hours of new video are being uploaded each minute. Another study reported that the average person watches 4.7 hours of television every day. 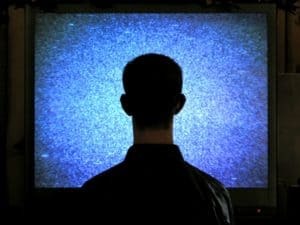 Life expectancy in the U.S. is currently 77.8 years so if you happen to be average then that would equal 15 years of your life just watching TV. It is estimated that the average mobile teen sends and receives 2,899 text messages per month. Did you know that 43% of 3-4 year olds have a TV in their bedroom? Is there a media saturation threshold? Does there come a point in someone’s life where a longing for something better, something real, something personal, something eternal, begins to break through the never ending digital stimuli? I truly believe many youth and adults are finding themselves pixeled out and more aware of a need for personal change. Yet they feel trapped and helpless and are not sure how to find freedom. They are awakening to the need but unsure of the path ahead. Most importantly they are beginning to see a possible correlation between their distracted lives and their distance from Christ. Are you finding that your plate is full at the end of the all-you-can-eat media buffet but your soul is increasingly more empty? Have you found yourself wandering in the digital wilderness and wondering if there’s something more to life? Are you concerned about those around you who are struggling to break free? Are you empathetic towards those who are numb and unaware that they are exchanging a truly satisfied life for pseudo living offered conveniently through today’s entertainments? Isaiah 55:2 Why do you spend money for what is not bread, And your wages for what does not satisfy? Listen carefully to Me, and eat what is good, And let your soul delight itself in abundance. The souls of this generation are lean. They need to be challenged but they also need to see others who are demonstrating what it means to respond to that challenge by learning to live in freedom from the distractions in this world with eyes trained on Christ. I hope that you and I will be the examples that this world needs; examples of what it means to follow Christ and grow deeper in our relationship with Him. No real relationship can thrive without regular and personal communication. So if you’re wishing you could conveniently find Jesus on Facebook, realize that you won’t find His profile until you have your face in His Book. If you’re wondering why He doesn’t text you, it’s probably because you haven’t responded to The Text He has already sent. He doesn’t need to use Skype, Twitter, instant messaging, or anything else that requires an internet connection. The connection He’s provided surpasses any global network and reaches beyond the universe into spiritual realms inaccessible to Verizon, AT&T or Sprint. 4G may be ten times faster than 3G but the kind of fast that we need in this society doesn’t have to do with downloads. It’s not about a strong signal or large bandwidth, but a broken heart and a contrite spirit. You don’t need high speed just bent knees.